With the YHD association who initiated the project and helped give it the form Stripburger has given you the privilege of enjoying new Stripburger’s issue tittled Handyburger. 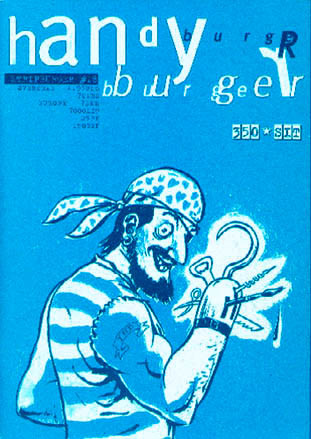 This issue continues the series of Stripburgers thematic issues (you may remember the Anti Nazi calendar, the Eco-Burger, the Human Rights postcard set and finally Stripburek, the Eastern European comics anthology). The publication was based on an international competition. We received works by 50 artists from 10 different countries. It was evident that the understanding of the words handicapped and deprivileged was very narrow as most of the contributing artists limited themselves to the purely physical sort of handicap. The main reason for this can be simply a better acknowledgment of this particular facet of the problem. The final selection of stories included in this book was done during long, lively discussions by the jury consisting of the members of both YHD and the Stripburger editorial board. The victory is mutual and selection a compromise, but at least we have pleased Its Majesty The Democracy. Whereas most of the former Stripburger issues were of the A4 size, we decided to go for a smaller format this time – its simply more handy. Reading it in public transport vehicles while hiding it from curious onlookers wont present much of a problem. The Handyburger will be safe from those infidels in waiting rooms, too. The English language? In these times of American cultural supremacy, this decision may look conservative, but it has its advantages. This way, the privilege of reading comics about being deprivileged will spread worldwide, as even some Americans understand English. The names of the winners are: M. S. Bastian, Chris Crielaard, Ivan Grubanov, Mladen Oljaca, Iztok Sitar.